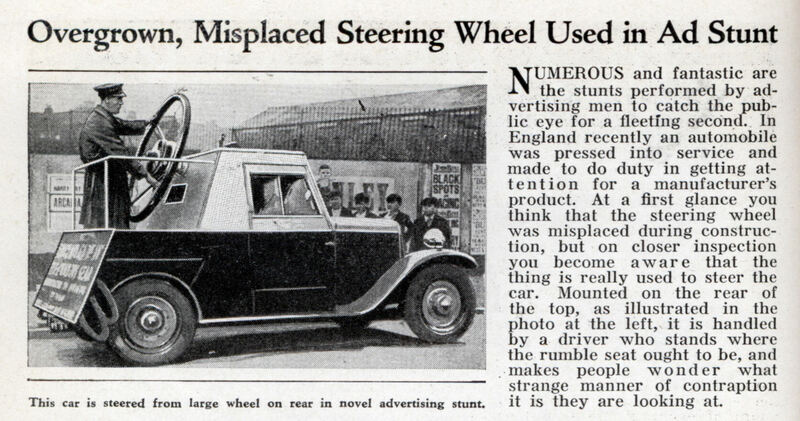 NUMEROUS and fantastic are the stunts performed by advertising men to catch the public eye for a fleeting second. In England recently an automobile was pressed into service and made to do duty in getting attention for a manufacturer’s product. At a first glance you think that the steering wheel was misplaced during construction, but on closer inspection you become aware that the thing is really used to steer the car. Mounted on the rear of the top, as illustrated in the photo at the left, it is handled by a driver who stands where the rumble seat ought to be, and .makes people wonder what strange manner of contraption it is they are looking at. The question remains, what were they advertising?